There's a moment in every high school basketball game, an instant that makes the difference, a play that lifts one team to victory and sends the other to defeat. For Jan. 25 of the 2019 Oregon high school basketball season, here's a look back at the Plays of the Day. To see complete game stories from all these contests, go to the Prep Basketball Tab. KENNEDY 53, GERVAIS 40: After struggling to fend off a tough Gervais team all evening, the No. 1 Trojans came alive in the final two minutes thanks to senior forward Kalyssa Kleinschmit. With her team clinging to a 43-38 lead with 2:30 remaining in the game, Kleinschmit was fouled on a layup attempt, hit the ensuing free throws and went on to score Kennedy's final 10 points to help the Trojans pull away from the visiting Cougars. KENNEDY 53, GERVAIS 40: Eager to prove themselves against the state's top 2A girls basketball team, the Gervais Cougars came out hot in the opening quarter. In the opening minute of play, sophomore guard Araceli Vasquez connected on a 3-pointer from the top of the key to give her team a 5-1 edge, setting the tone for a valiant effort against the No. 1 Trojans that stayed within five points until the final two minutes of play. DAVID DOUGLAS 61, GRESHAM 56: Trailing by one points with a couple minutes on the clock, David Douglas patiently hunted for a high-quality shot. Guard Jermaine Robinson faked a 3-point try, but held onto the ball and it eventually ended up with Dakota Lohmeier, who had an open look at a corner "3." The shot rattled out, and Lohmeier missed a couple contested follow ups at the rim. But Robinson swooped through the lane and grabbed a third offensive rebound and scored the winning bucket in a crowd at the front of the rim with 59 seconds left. 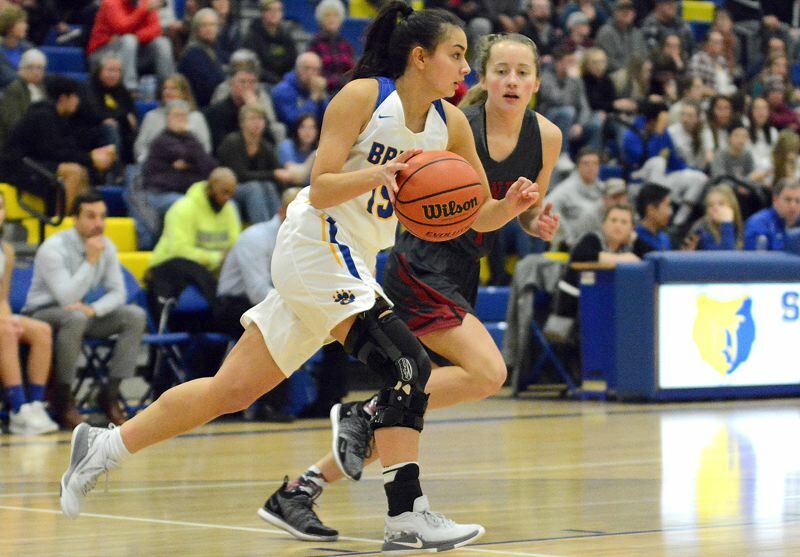 BARLOW 55, SANDY 39: Barlow's Jocelyn Richardson sank 3-pointers on each side of halftime to help turn a five-point Bruins' lead into a 20-point margin late in the third period and set the table for her team's 55-39 victory. TIGARD 48, TUALATIN 23: Tigard senior guard Campbell Gray opened the game with back-to-back baskets, both coming on follow-up shots, to ignite an 8-0 Tiger run to start the Three Rivers League contest played Friday at Tualatin High School. From there, the Tigard girls were never threatened as it ran to the 48-23 victory. TIGARD 75, TUALATIN 72: Tigard sophomore Drew Carter scored eight points in a span of 1 minute and 46 seconds early in the second quarter. His scoring spree included a 3-pointer, which gave the Tigard boys a 42-33 lead at that point of the Three Rivers League contest, played Friday at Tualatin High School. CROOK COUNTY 60, RIDGEVIEW 35: The Crook County Cowboys held a narrow 24-18 lead when Hunter Bishop took a pass in the left corner and drained a 3-pointer late in the first half to give Crook County a nine-point lead. From that point on it was all Cowboys as the Crook County boys outscored Ridgeview 33-17 the remainder of the game to take an easy win. RIDGEVIEW 55, CROOK COUNTY 32: The Ridgeview Ravens led just 20-17 early in the third quarter when Alaina Clark drove into the key, made a shot and was fouled. Clark converted the three-point play, igniting the Ravens, who outscored Crook County 20-7 in the quarter as they took control of the game. CANBY 77, LAKE OSWEGO 75: After a back-and-forth roller coaster of a game that lasted almost 2 1/2 hours and took Canby and Lake Oswego into three overtimes, the Cougars finally sealed their win when junior guard Naarai Gomez knocked down two free throws with 20 seconds left to seal her team's Three Rivers League win.